Hey all it’s Ginny again bringing you another intro at the Griffith Park (1939 Georgian) house we’ve been working on. 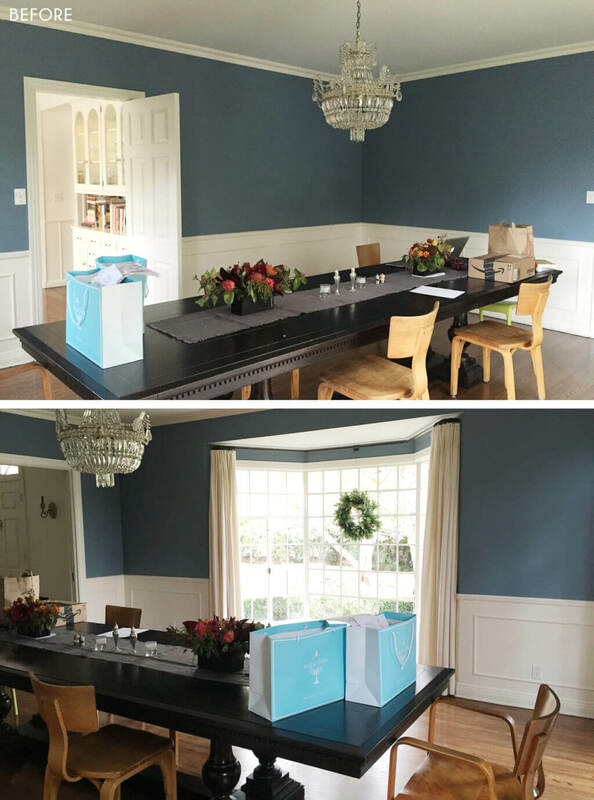 We already posted about their Sunroom and Living Room so next up is the Dining Room. 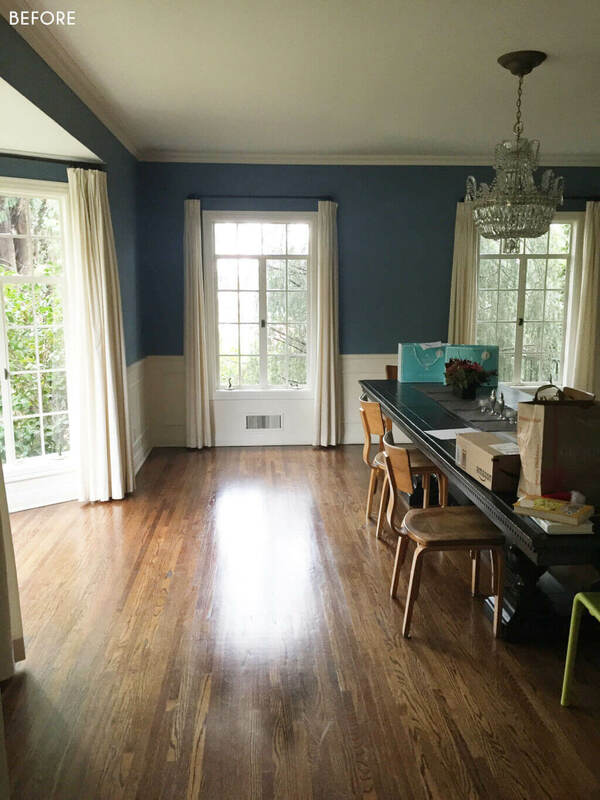 They loved the design of the Silver Lake Hills dining room and really wanted us to channel that vibe. 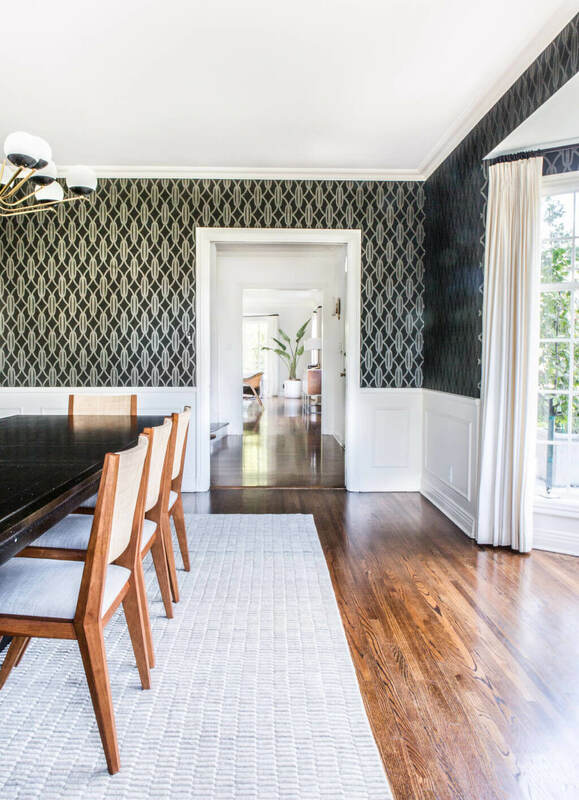 They’d already tried to purchase the wallpaper Emily used in there, but sadly it’s been discontinued (why would they do that, yet still have the raspberry color?!). With this being their main dining space we did want to make it feel really special and eclectic yet formal but not too stuffy. 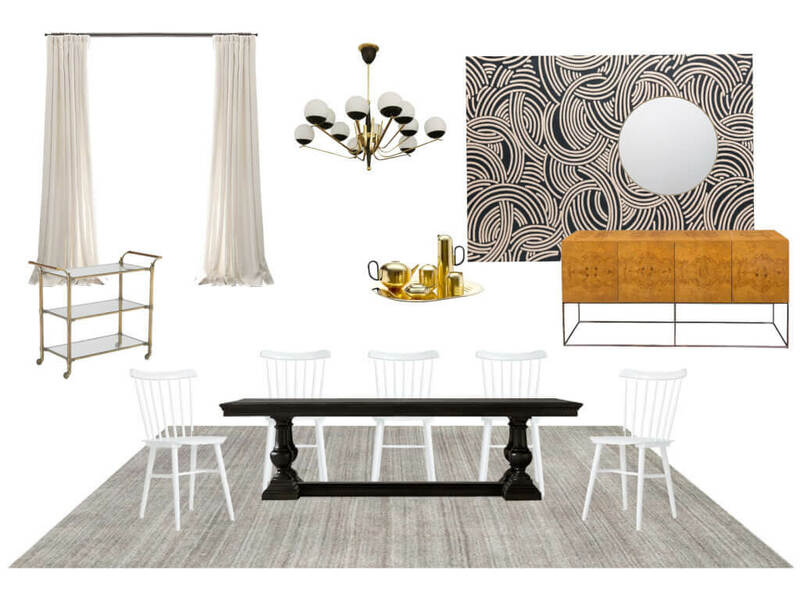 We wanted use a mix of vintage and new in this room so we didn’t do a crazy amount of moodboards. The one above was used as an aid to capture the general vibe and get conversations started. The room is rather wide which gave us plenty of space for a buffet as well as a bar cart. Burlwood was a high contender for use in this house and we have other pieces in the living room and bedroom. 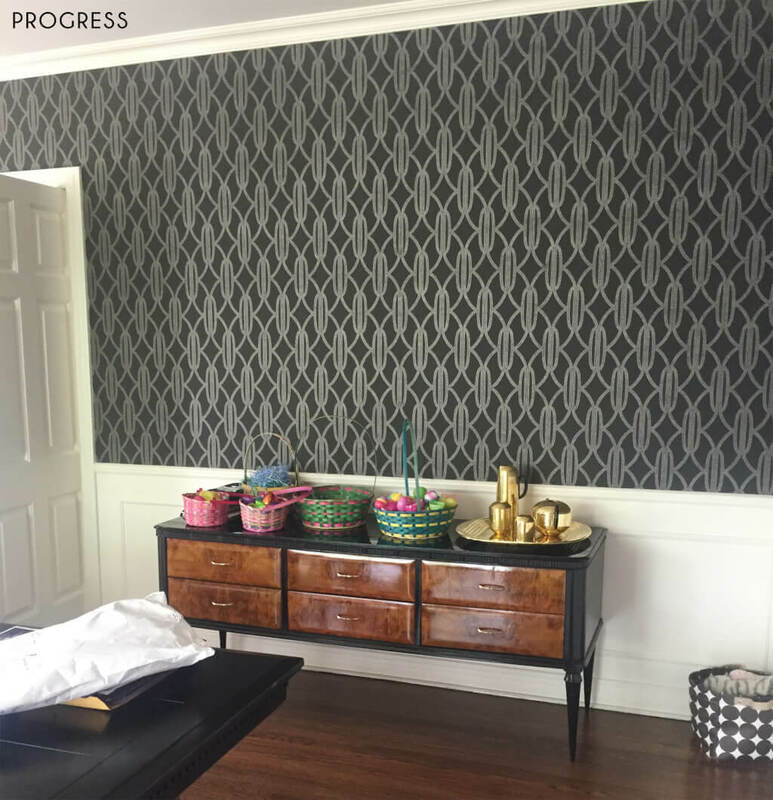 We brought over a lot of options of wallpaper including some that had similar deco style detailing to the one from the Silver Lake house. 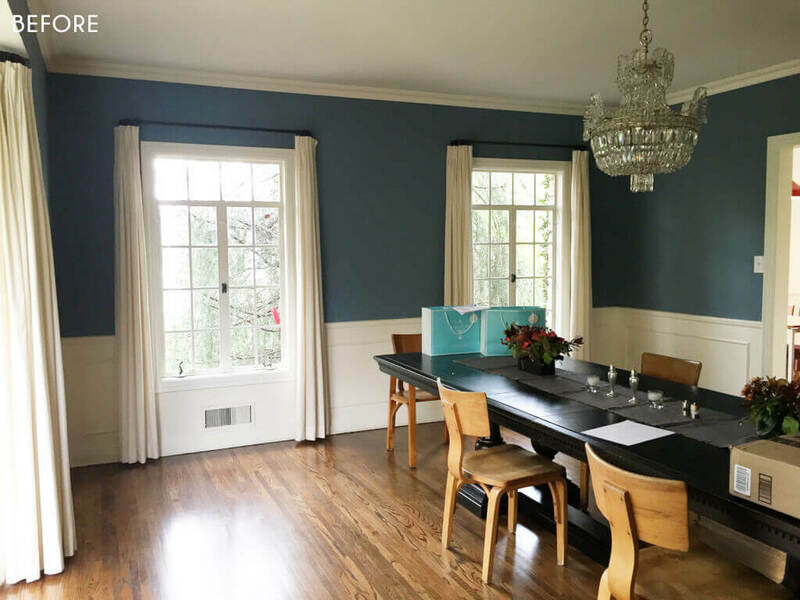 The one on the board above is from Farrow & Ball and I’ve seen this installed at Big Daddy’s showroom in LA – it’s not as bonkers as it might seem and the more muted, tonal colors are really beautiful. 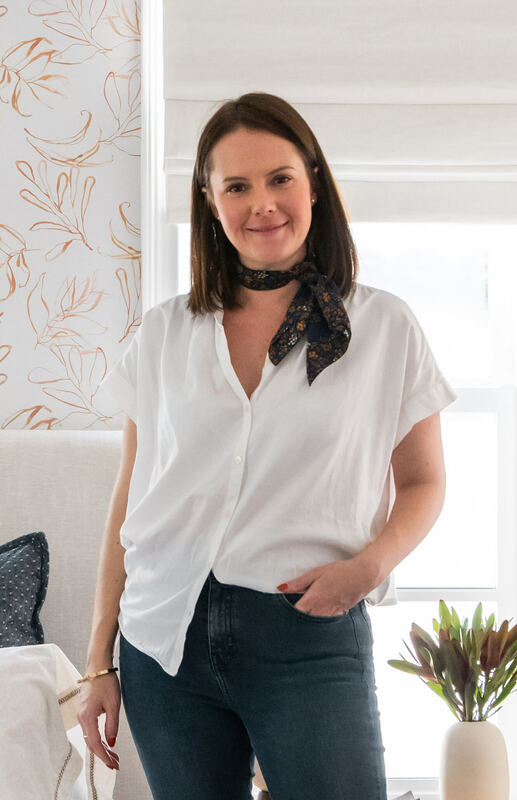 The pattern in the wallpaper is made up of tiny metallic silver dots (or pearls as they are called on their website) which is very subtle but still feels dramatic and eye-catching. It took many attempts, but I managed to twist their arm into buying the 1960’s Italian Stilnovo style chandelier. It also sparked off a love for other Stilnovo lamps in this house which you’ll see in other rooms. The chairs already belonged to the clients and while the style doesn’t really work in here, the idea of using wood did. 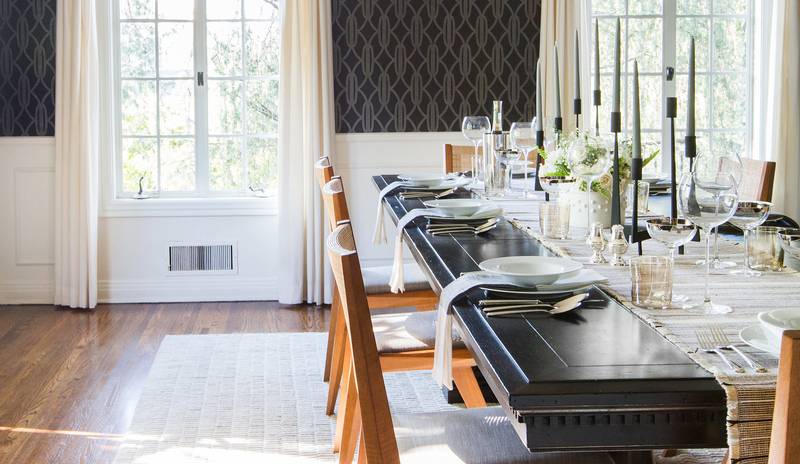 White would be too contrasting and anything really dark would get lost against the dining table. 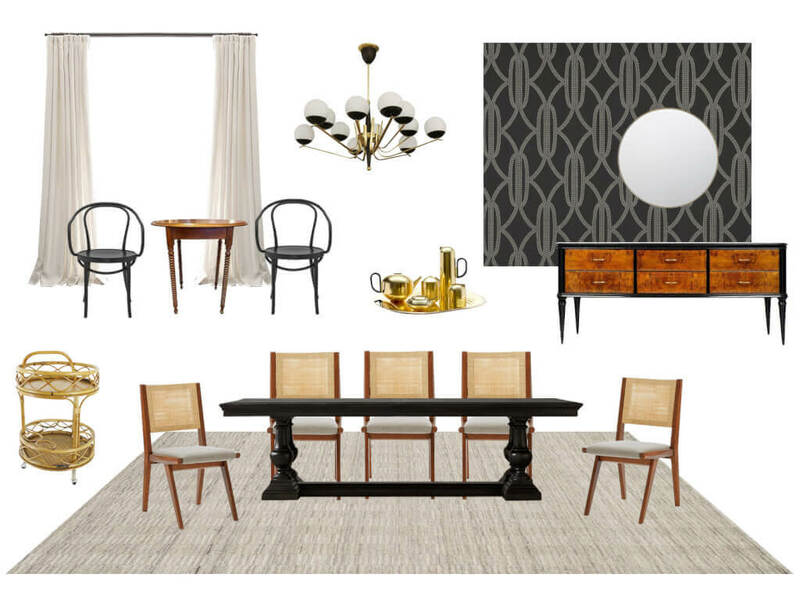 They really wanted 10-12 vintage worn leather chairs (that didn’t cost a small fortune) which was virtually impossible to find, especially when taking into account the size of the dining table. Here you get a detailed view of the rug that we got from Loloi. 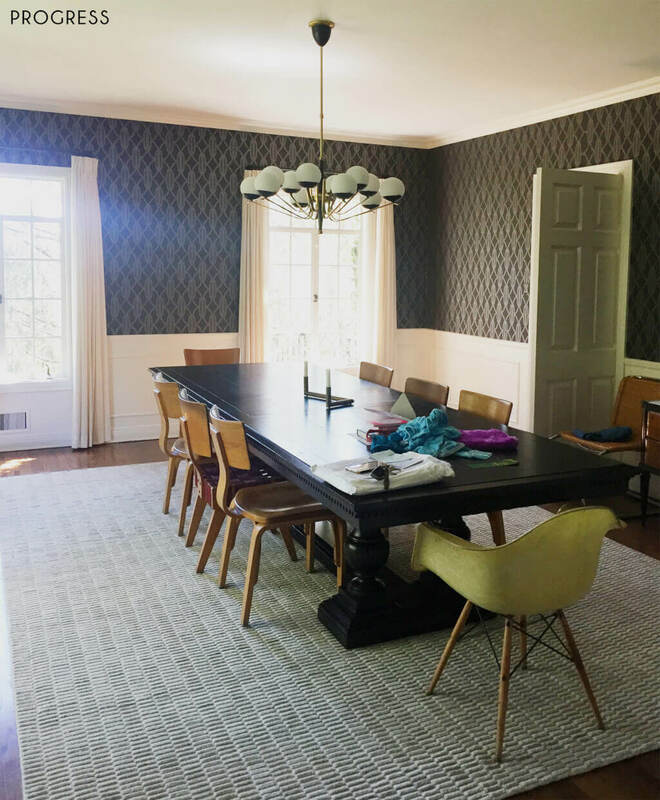 It’s fairly low pile and has a striped ribbed detail – nothing too fussy because we wanted the wallpaper to be the focus in here. The tone is oatmeal with light and dark colour flecks in it, rather pretty in person.